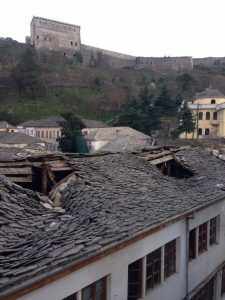 Visit Gjirokastra: The future of the city is in the hands of its visitors, and the only way to raise funds for the necessary restoration and development of the site is by increasing the number of people who visit the city. During the past years, however, a modest economical increase has persuaded the Albanian government and international donors to release funds for current projects in the city, and we hope this will continue and increase in the future. By coming to Gjirokastra, you will help in keeping the Stone City alive, so make sure Gjirokastra will be one of your stops in Albania! Promote Gjirokastra to any organization that can help it. Contact the GF for advice on how to get these organizations involved. In order to understand more on the challenges of the town, please read the message from our Director. Make an internship or volunteer: if you are a student of architecture, fine art, conservation or other related subjects, then Gjirokastra is the perfect place for an internship. The GF cannot provide funds for internships but will happily facilitate your stay and develop a programme to compliment your studies. The same applies if you would like to volunteer. Packard Humanities Institute; The Butrint Foundation; The Headly Trust; EU; GIZ; SWEDEN; USAID etc.